Industrial facilities with above-ambient temperatures depend on insulation for process efficiency, system health, and personnel protection. 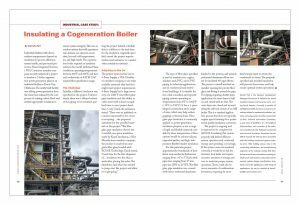 Brace Integrated Services, a NIA Contractor member company, recently undertook a project to insulate a 2-boiler cogeneration power generation plant at an industrial facility in Ponca City, Oklahoma. The newly built facility was adding power generation from the waste heat released by the core process of making carbon black and needed appropriate insulation to ensure system integrity. This was an outdoor system that will experience rain, intense sun exposure, snow, sleet, hot and cold temperatures, ice, and high winds. The cogeneration boiler required an insulation solution that would withstand these conditions, operating temperatures between 400°F and 600°F, and thermal conductivity of ASTM C547 mineral fiber specification range. Initially, a different insulation was specified for the project. Unfortunately, there was a delayed release of the piping to be insulated, putting the project behind schedule; this, in addition to the lead time for the insulation originally specified, caused the project superintendent and estimator to consider other insulation materials. The type of fiber glass specified is used to insulate iron, copper, stainless steel, PVC, and CPVC piping in industrial applications, and in commercial and institutional buildings. It is suitable for hot, cold, concealed, and exposed piping systems operating at temperatures from 0°F to 1000°F (-18°C to 538°C). It has a 1-piece hinged construction and a range of sizes, which may help reduce gapping or thermal leaks. Fiber glass pipe insulation is commonly applied on power generation insulation projects, as are a range of rigid and flexible materials suitable for these temperatures. Other options would be calcium silicate, expanded perlite, and high-temperature flexible blanket insulation. For this particular project, approximately 4 truckloads of insulation were needed in thicknesses ranging from 1 ½” to 5” thick, with pipe sizes ranging from ¾” iron pipe size (IPS) to 22” IPS. The fiber glass pipe insulation was covered with stucco-embossed aluminum banded to the systems, and pressed, preformed aluminum elbow covers for insulated 90° pipe elbows. The process to install involved an installer opening the pre-slit fiber glass and fitting it around the pipe. For piping requiring double-layer application, the inner layer is held on and closed with tie wire. The outer layer was closed and secured using the self-seal closure of an ASJ jacket. This is a standard application process that does not typically require special training for a professional quality insulation contractor. The project is ongoing and is expected to be completed in fall 2018. Insulating this system properly will deliver efficient system operation and continued energy and operating cost savings. If the system were not insulated correctly, it would be at risk for excessive heat leaks and require excessive amounts of energy and cost to maintain proper system operation. There could also be excess amounts of condensation formation, requiring far more heat/energy input to return the condensate to steam. The properly specified and installed insulation will prevent these issues and help ensure optimal system operations.